The Villages, Florida United States - VILLAGE OF GILCHRIST - COURTYARD VILLA | RE/MAX PREMIER REALTY Inc. Beautifully decorated 1,667 square feet of living space in a Arlington Courtyard Villa. Every room has special touches designed by the owners. The kitchen has special tile back splash, pendant lightning over the bar area and beautiful accent lighting over the kitchen cabinets with very nice accent pieces highlighted. The dining area is located directly next to the kitchen and flows to the main living area. Living room has a reclining chair and features a 60" flat screen TV for your viewing enjoyment. Master bedroom has a king bed and a 40" flat screen TV wall mounted. Master bath has a walk in shower with dual sinks and a nice closet area with plenty of storage. Second bedroom features a queen bed with a nice closet storage area. Third bedroom has a queen bed with another closet for storage. A second bath is located between the 2nd and 3rd bedroom with a tub and shower. Lanai has a SW exposure and is screened in for your enjoyment. The courtyard features a nice size lot with a table and chairs for your outside enjoyment. This unit has a gas grill, Wi-Fi, cable TV and has an inside laundry with washer and dryer. Unit does not accept pets. 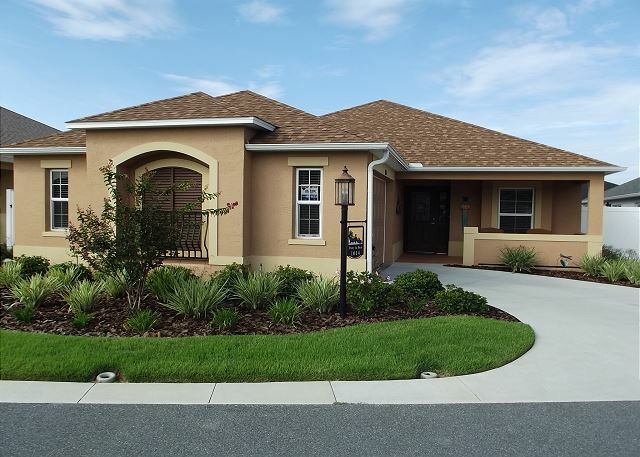 Atmore Villas are conveniently located to both Bonifay and Evans Prairie and close to Pinellas and Colony Plaza shopping centers where there are restaurants, grocery shopping and retail stores. A guest from Jenison, MI United States recommends this vacation rental. Perfect location for us. A short cart ride to Bonifay Country Club and pool. The home was very clean and had all the things we needed to enjoy our stay. We would definitely rent here again. A guest from WILLIAMSBURG, VA United States recommends this vacation rental. Home was very clean and well maintained. The three bedroom was perfect for my husband and I and our two teenagers. It had everything we needed for our stay. Location was within 4 miles of my parents, within a 70 min drive to Orlando, within an 80 min drive to Tampa and a short drive to Walmart and restaurants. The property manager was very helpful with my questions. I would recommend this rental and would stay there again. Steve and Linda G. from Hannon, Ontario Canada Canada recommends this vacation rental. Nice roomy house in a great location. David & Polly M. from Seattle, WA United States recommends this vacation rental. We Enjoyed our stay and found the house very good for us. A guest from North Lima, OH United States recommends this vacation rental. Thank you for your review, happy you enjoyed the home. Hope to see you again next year!